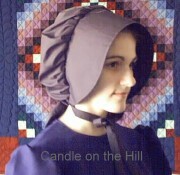 This winter bonnet is my winter favorite due to its warm, comfortable design and easy construction compared to other outing bonnet styles�no pleating or bonnet board needed! Brim and gently gathered crown are lined for cozy warmth and comfort. Fits over most headcoverings. Diana of Christian Coverings in Iowa has long offered this bonnet ready-made and now the pattern is available to the home-sewer! 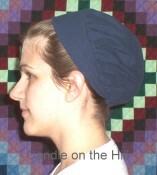 You can get this covering custom-made from Christian Coverings.